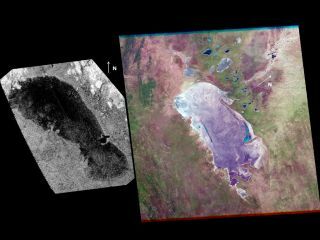 The lake known as Ontario Lacus on Saturn's moon Titan (left) bears a striking similarity to a salt pan in Namibia known as Etosha Pan (right), a new study finds. Ontario Lacus, imaged by NASA's Cassini spacecraft on Jan. 12, 2010, covers an area about 140 by 47 miles; Etosha Pan, imaged by a NASA/USGS Landsat satellite on Jan. 21, 2003, covers an area about 75 by 40 miles. An enormous lake on Saturn's moon Titan apparently behaves like mudflats on our planet, draining and refilling over time, according to a new study. Scientists have long thought that the lake, known as Ontario Lacus, is a relatively stable body completely filled with liquid hydrocarbons such as methane and ethane. However, a new analysis of data from NASA's Cassini spacecraft finds evidence for long-standing channels etched into the southern end of the lake bed. This suggests that Ontario Lacus is actually a depression that periodically dries out and then refills from below, researchers said. In this way, the lake could be similar to the Etosha salt pan in Namibia, a wildlife hotspot that fills with a shallow layer of liquid when groundwater levels rise during the rainy season. At 3,200 miles (5,150 kilometers) in diameter, Titan is nearly 50 percent wider than Earth's moon. The only moon in our solar system larger than Titan is Ganymede, which orbits Jupiter. Titan is the only world beyond Earth known to harbor stable liquids on its surface. The moon has a weather cycle just like our planet does, although Titan's is based on hydrocarbons rather than water. These liquids cycle between the atmosphere, surface and subsurface, and the huge moon's lakes are an integral part of this process. Complex organic molecules swirl about in Titan's thick, nitrogen-rich atmosphere, further intriguing astrobiologists who regard the body as one of the best places in the solar system to search for extraterrestrial life. The new study is part of an ongoing investigation of Ontario Lacus, the largest lake in Titan's south polar region, researchers said. Cassini has been observing the lake to see if Titan changes with the seasons just like Earth does. During the time Cassini has been exploring the Saturn system, Titan's southern hemisphere has transitioned from summer to fall. Cassini launched in 1997 and arrived at Saturn in 2004. The spacecraft has been studying the ringed planet and its many moons ever since, and will continue to do so for years to come. Last year, NASA extended the probe's mission to at least 2017.